Macabea Hostel & Pousada i Paraty, Brasil: Bestill nå! Não há cobrança de multa por cancelamento até 15 dias antes da chegada. Caso o contrário será cobrada uma taxa de cancelamento de 50% do valor das diárias, debitado no cartão de crédito do cliente. Em datas especiais, eventos e feriados, a estadia mínima pode ser alterada para duas ou mais diárias. Servimos jantares e agendamos passeios turísticos com taxa adicional. 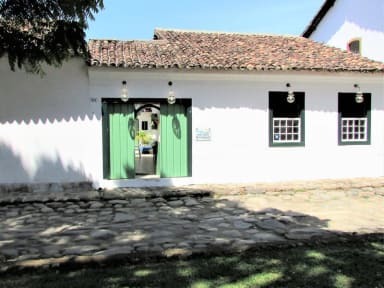 The hostel is located in the Historic Center of Paraty; it operates in a restored 19th century mansion. Upon arrival, you will be greeted by friendly staff that will provide you with the best sightseeing advice. 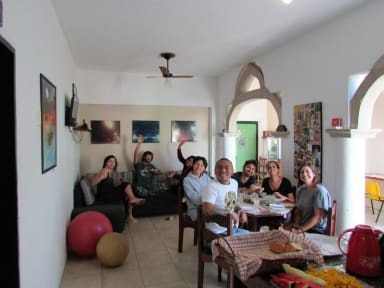 For breakfast we offer coffee, tea, milk, fresh juice, three types of bread, with option for guests with gluten intolerance (tapioca-a typical Brazilian dish), three types of tropical fruits, cheese, ham, cereal, chocolate, wafer, cake and butter. In the common area we have a living room with cable TV, magazines, books, games (Xbox), free internet, tables and a sofa. We also have a table for computer use. We also offer handmade hamburgers and sandwiches, with vegetarian options. You can also try some typical Brazilian drinks, such as caipirinha and the famous 'Jorge Amado' made with Cachaça Gabriela. All at a fair price. The rooms are equipped with ceiling fans, air conditioning, individual lockers and bathrooms. Also access to a external bathroom. With 24 hour security and a fully equipped kitchen for collective use. We do garbage separation and reuse of water. The best thing about staying at Macabéa Hostel is that you will be staying in the best location in the city. Close to the bus station, drugstores, supermarket, shops, restaurants and Pontal beach. Everyone should have the experience of staying in the Historic Center, it's really cool, there's no parking ticket for cars, and you can walk the streets peacefully. We are behind the Church of the Rosary, one of the main postcards image, great place to rest, take beautiful photos and make new friends.